Johannes Schöner, an astronomer, mathematician and globe maker, was the original owner of the Waldseemüller 1507 and 1516 world maps now in the Library of Congress. It was Schöner who placed the maps in a portfolio that was later acquired by a German prince and stored in a castle for nearly 400 years. The Library of Congress, in conjunction with the Washington Map Society, will hold a lecture to discuss how Schöner used the Waldseemüller maps and other materials to produce his globes and develop new methods of mathematical cartography. John Hessler will present “Zeno’s Mice: Regiomontanus, Martin Waldseemüller and the Life of Johannes Schöner 1477-1547” at 7 p.m. on Thursday, Nov. 13, in the Geography and Map Division Reading Room on the basement level of the James Madison Building, 101 Independence Ave. S.E., Washington, D.C. The 1507 world map by Martin Waldseemüller is known as “America’s Birth Certificate,” because it is the first document on which the name “America” appears. 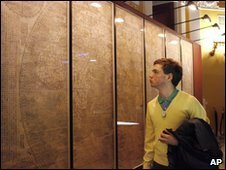 The Library of Congress purchased the map for $10 million in 2003, concluding a long effort to bring the map into the United States. In 1901, Schöner’s portfolio was discovered in the library of a castle owned by the family of Prince Waldburg-Wolfegg in Baden-Württemberg, Germany. 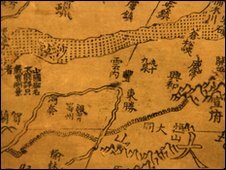 The map was uncovered and revealed to the world by the Jesuit priest Josef Fischer, who was conducting research in the Waldburg collection. According to Hessler, Schöner collected manuscripts of many cartographers and astronomers of the period. Schöner also owned some of the most important books on cartography and geography that were available to him, including copies of the 1482, 1509 and 1513 editions of “Ptolemy’s Geography,” now in the Austrian National Library in Vienna, and Martin Waldseemüller’s “Cosmographiae Introductio.” These works contain a great number of handwritten corrections and complex annotations that reveal Schöner’s thinking about theoretical cartography and the state of the art in the early 16th century. Hessler will show for the first time how Schöner used the Waldseemüller maps and other materials for the production of his globes and also in the development of new methods of mathematical cartography. In addition, Hessler will discuss the difficulties of researching Renaissance cartography and will try to dismiss many of the myths and platitudes that have plagued Waldseemüller scholarship for more than a century. Hessler has written extensively on the history of classical and Renaissance cartography and is the author of “The Naming of America: Martin Waldseemüller’s 1507 World Map and the Cosmographiae Introductio” (2008), which is a new translation of, and commentary on, Waldseemüller’s seminal text. A fellow of the Society for Archaeogeography, he is currently at work on a new Latin edition of the 6th-century “Corpus Agrimensorum,” a collection of Roman surveying manuals from Late Antiquity. He also runs the historical map analysis Web site www.warpinghistory.blogspot.com. From Reuters: The only surviving copy of the 500-year-old map that first used the name America goes on permanent display this month at the Library of Congress (LOC), but even as it prepares for its debut, the 1507 Waldseemuller map remains a puzzle for researchers. More of that article. Info from LOC on the map and how to visit here.